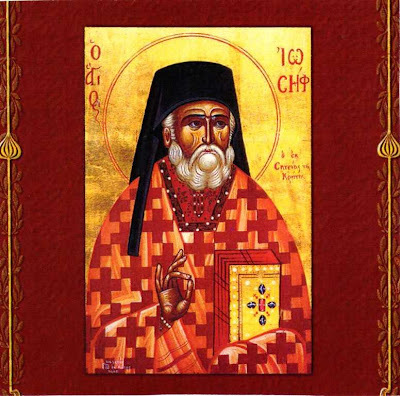 Our Venerable Father Joseph the Sanctified, surnamed Samakos, was born and raised in Crete. He came into the world a short time before the destruction of Constantinople, around the year 1440, from pious and God-fearing parents in a village called Keramoi. Most people believe that Keramoi is today's small village of Azokeramos, which is found at the easternmost end of the province of Siteia that is distinguished even today by the piety of its people. His good parents brought him up with the pure milk of godliness and educated him with the beginning of wisdom, which is the fear of God. So, from a young age he learnt holy writ and filled his soul with holy zeal running like a thirsty deer to the revered Monastery of Panagia Akroteriane, which is found in the region close to his village and which at that time was in full spiritual bloom. This Patriarchal Stavropegial (under the direct auspices of the Ecumenical Patriarchate) Monastery, exists today, unfortunately more as a tourist attraction than an actual monastery, known since the last years of Turkish occupation as the Monastery of Toplou. Under the protection of the Akroteriane Mistress (the Theotokos), he fed his soul with the solid food of the neptic tradition (ascetic fathers) and learnt to fight the invisible war against the three-headed monster: flesh - worldliness - the devil. He was initiated into the sweetest secrets of pure prayer and God-loving loquacity, filling his heart with divine love for Christ. 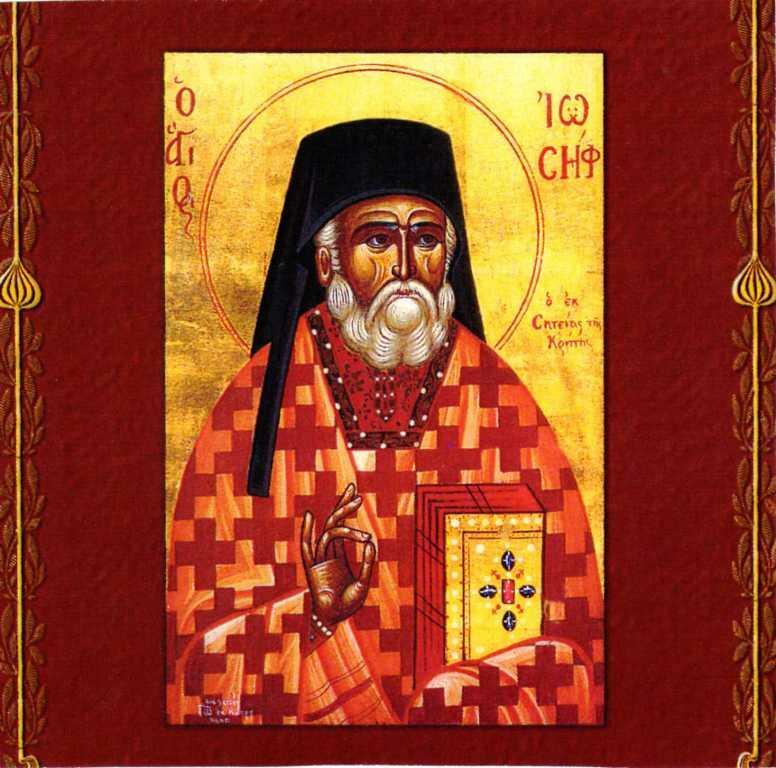 When he at last reached a suitable age and with the blessing of his Spiritual Father he left the monastery and went to Handaka (today's Heraklion). This was the Great Castle where there was the small Monastery dedicated to St. John the Theologian, a Metochion (subsidiary) of the Monastery Panagia Akroteriane at Siteia, at an area called Dermata. Today the Church of the Holy Trinity stands at that spot. There he put himself under the direction of the Geronda (Spiritual Father or Abbot) of that monastery. 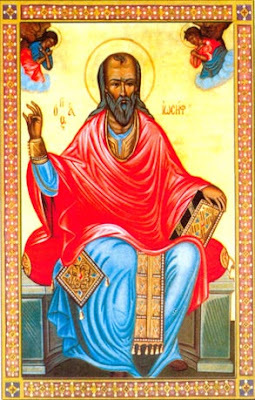 Being next to his holy Geronda and with blessed in the Holy Spirit obedience, he started the ascetic endeavors and fasting, the hardships and discipline of the body for the taming of the old man (sinful nature), and gradually became a clean and roomy vessel, ready to accommodate the Grace of God. When his pious parents slept in the Lord, he distributed his inheritance to the poor according to the words of the Lord: "If you want to be perfect, go and sell your belongings and give the money to the poor; you will then have treasure in heaven. Then come and follow me" (Matt. 19:21). He then bid the world and its pleasures farewell and offered his whole self to Christ, wearing the holy habit of a monk. With the angelic habit of monasticism, with great and honest struggle and patience he attracted upon himself Divine Grace, which blessed his efforts and tears, and increased in the field of his soul the flowers and trees of the holy evangelical virtues he cultivated there. Decorated thus with these Christ-imitating virtues he stood apart within the monastic brotherhood and, despite his youthfulness, he had arrived at spiritual heights as if he were a white-haired elder. He was, as is said in these circumstances, a paedariogeron or young-elder. All respected and esteemed him seeing his spiritual progress, his virtue and his Godly wisdom and prudence. Therefore, very soon, with the exhortation of his Elder, he received the grace of Priesthood. He put on the holy epitrachelion (stole) and was established as a minister and steward of God's Mysteries. When his affectionate Geronda peacefully passed away, the holy Fr. Joseph executed his duties and orders to the letter, with every piety and care as a devoted son. At the same time he increased his holy zeal and any talents and charismata he had been given by God and cultivated them with an even more sense of honor and self-respect. He lived his monastic life as a bodiless angel, having in his mind exclusively the thought of how to please the Lord everywhere and always. He pushed himself with hardship, he attended his emotions very carefully, he purified his body, he kept his tongue from any evil words, he prayed unceasingly and always had the memory of death to bridle the human passions and distance the danger of sin. At the same time he honorably cultivated the charisma of the holy Priesthood, pastoring the logical sheep of Christ with love and self-denial, comforting, supporting, advising, teaching, reprimanding, according to circumstance. He especially took utmost care to cultivate love, practicing charity and brotherly love. His priestly conscience was never tainted with the smear of greed, and whatever philotima (gifts of money) were given to him by the faithful he distributed to the poor. Indeed not only the money but even the Prosphora (oblation bread) that were left over from the Liturgy he gave away not keeping even the basic needs for his own sustenance. He was totally poor for Christ, absolutely faithful to the monastic rule of total poverty! At one time, it is said, he had distributed the Prosphora to the poor in advance forgetting to keep one for the Liturgy. When the time came for Liturgy, his helper sadly informed him that there was no Prosphora. St. Joseph was not fazed but replied to his helper that God would provide Prosphora for the Eucharist, and then started to pray. In this way Abraham had at one time replied to his son Isaac's question in regard to the lamb that was to be sacrificed: "God will provide the sacrificial lamb, my child!" (Gen. 21:8). Truly God did provide a ram in a bush called savek, which Abraham sacrificed, instead of Isaac. Similarly now God provides for the Prosphora at the bloodless sacrifice by a miracle! The server had barely entered the holy Sanctuary when he found a heap of warm well-baked Prosphora ready for the Liturgy! You see, our God, "Jesus Christ is the same yesterday, today and for ever!" (Heb. 13:8). Thus He acts accordingly to the petition and the needs of His saints. The whole life of the humble Hieromonk (Priest-monk) Joseph was a Christ-life. His thoughts were Christ-thoughts and his feelings were Christ-feelings. Whatever was his was first Christ's then his, his own soul was Christ's firstly then his. To him everything everywhere was Christ the Lord! In this way his life was the life of Christ extended through him to his times, which is the life of the incarnate Divine Word, the Theanthropos (God-man) Jesus, who became man so as to present and offer us, as a man, His divine life (see "Together With All the Saints: Man and God-man", p 80-81, by Archimandrite Justin Popovich). But because Christ said to his followers "you will have affliction in the world" (John 16:33), in other words - "the world will make you suffer", Venerable Joseph was allowed to be tested. One day some vulgar-mannered Jews from the Great Castle, acting polite and courteous, offered him a cup of wine as he passed by their way seemingly to offer hospitality but in reality to mock him. He graciously accepted it, he blessed it with the sign of the cross, being a priest, drank a little for love and wished them the best, thanked them and poured the rest back into the container from which it came. They on the other hand considered this blessing of St Joseph an offensive insult. They fell upon him and insulted him in a vulgar and barbarous way dragging him by force to the courthouse of the Duke, where they accused him of insult against their religion. The man of God though was justified by the impartial judge and his accusers went away, thoroughly ashamed and embarrassed. Blessed Joseph lived 71 years on this earth. 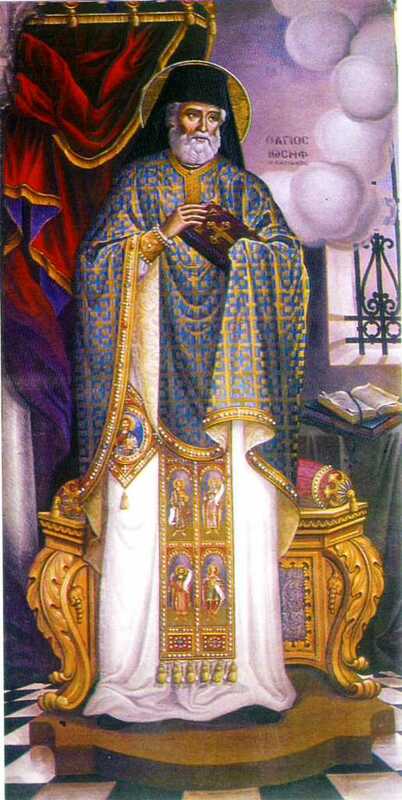 He came, with the power of the Holy Spirit, to be clothed with Christ (through his constant prayer and extensive sacramental life on the one hand, and with the systematic cultivation of the evangelical virtues together with his imitation - according to his ability - of the Lord within the angelic monastic community on the other). He was filled completely by the Grace of the God-man Christ and was transfigured gradually into a God-bearing and God-like human, into a perfect man according to the prototype of Christ (see p. 97 of Justin Popovich's previously referred book). In this kind of condition the calling of the Lord for the eternal life and kingdom found him on the 22nd of January 1511. Thus his death was a holy sleep in the Lord. It was a pascha, and a passing over from corruption and vanity to immortality and eternity. From this valley of tears, to the place of never ending joy, where the pure sound of those who always feast and have happiness singing with delight the "Glory to You O Lord" is found! He passed from the Egypt of death to the Land of Promise (the eternal Life and Kingdom of the All-holy Triadic God). Many miracles and signs followed the sleep (death) of Hieromonk Joseph. Many persons saw holy visions again and again. Thus a few years later his venerable body was exhumed and was found to be incorrupt and whole, giving off a divine aroma, which gave great joy to those who venerated it. In conjunction to this were many miracles, especially healings of illnesses and sicknesses for many who approached and venerated in faith and piety. This is indeed proof that God in His great goodness and loving kindness, can be touched or partaken through His uncreated divine energies as the Holy Fathers, divinely inspired, teach us. For what else but participation, not only spiritual but physical, in these divine energies, is witnessed by the incorruption, the aroma, and the miracles which are done by the holy relics of the Saint. Glorified, therefore, is the most-praised and worshipful Name of the Father and the Son and the Holy Spirit! Which God is great as our God? 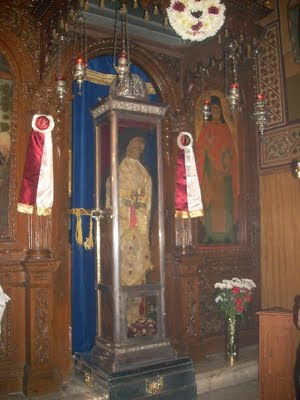 When the impious Agarenes (Muslims), by God's allowance because of our sins, invaded the island of Crete in 1669, a pious priest called Antonios Armakis, intending to protect the holy relics of the Saint from the impure hands of the God-hated barbarians, took it with him and escaped to Zakynthos. There he placed it on the 29th of August that year in the Convent of St. John of Mantineia, in the region called Xerovounia (Dry-hills). From there, in 1915 it was transferred to the Church of the Pantocratora in the suburb Gaitani of Zakynthos City, where it is still treasured today whole and complete. This is where pious people come and venerate the relics and receive spiritual support and divine blessing and where supernatural miracles happen at certain times according to the faith of those who approach. At the birthplace of the Saint, Azokeramos of Siteia, a domed church was built in his memory, which celebrates its feast on the 22nd of January, and many people gather from Siteia and the surrounding towns. I personally, as the former Vicar-General and Preacher of the local Diocese there, was deemed worthy to liturgize on many occasions speaking the praises of the Saint for the glory of God and our spiritual edification and salvation. 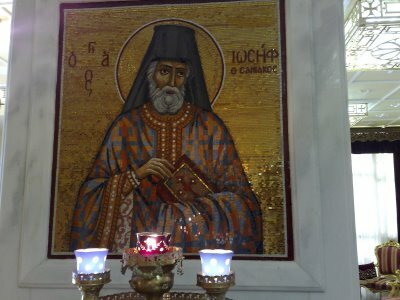 Also in the newly built tri-naved Basilica of St. George, the southern nave was dedicated to the Venerable Joseph, where the faithful come to be comforted by their Sanctified (as they simply call him) compatriot. 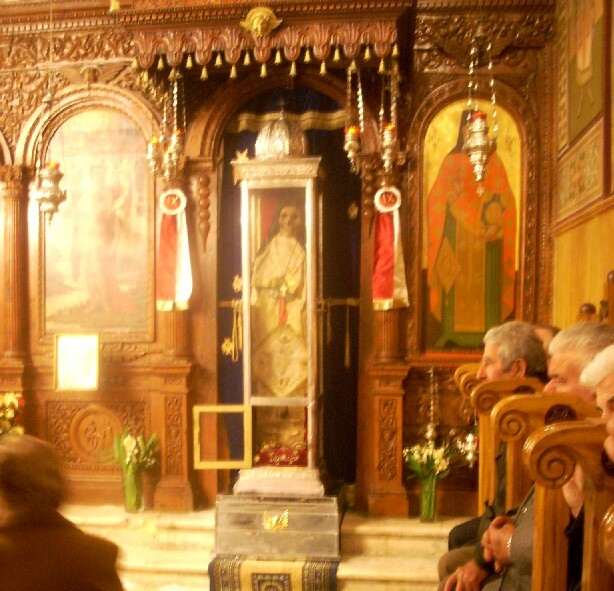 In the city of Heraklion, at the parish Church of the Holy Trinity, which stands on the spot of the Saint's Monastery, the memory of Venerable Joseph is also celebrated with great solemnity. 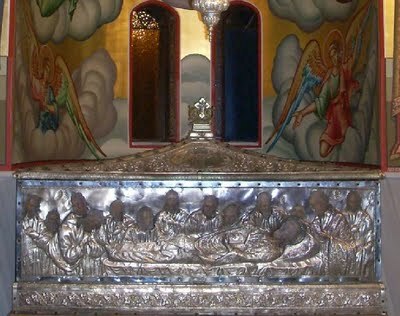 In Zakynthos they tend to celebrate the placing of his relics there on the 29th of August, when they take the holy relics in procession through the streets of Gaitani. 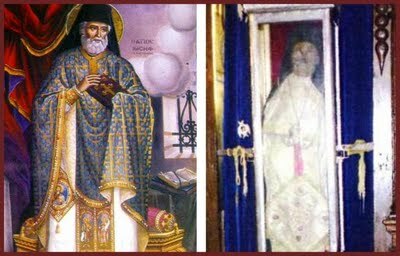 May the grace of the Venerable Saint protect both Crete that begot him, Zakynthos that keeps his relics and every faithful and saint-loving person, from every want and affliction. Amen. The offspring of Crete, the pride of Zakynthos and the glory and praise of the Fathers: let the faithful honor Joseph of blessed memory with hymns, whose body the Holy Trinity honors with unspeakable glory, and which has been preserved incorruptible. Glory be to Him who has sanctified him. Glory be to Him who has crowned him. Glory be to Him who has proclaimed him a guardian and has made him an unmercenary physician to those who suffer. You are the advocate for the faithful and you deliver them from all suffering through your intercession to God, Joseph, renowned by all, the pride and glory of the Venerable Ones. Rejoice, brilliant progeny of Crete. Rejoice, inviolate treasure of the Church. Rejoice, guardian and protector of Zakynthos, thrice-blessed Joseph, the pride of the faithful.